"This bike is called Tigger Farhad. 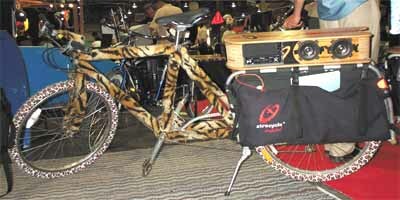 The costume designer was Ben Sarrazin (Yuba impressario); it was the first Xtracycle sound system bike that I know of, called the Salsa Cycle, inspired by a fruitless search for a Salsa club one night in San Fran. We said, "we have the crew, we just need the music". It inspired Fossil Fool to create the first soul cycle, and Rock the Bike was born..."